We first apply our big idea–backward induction–to analyze quantity competition between firms when play is sequential, the Stackelberg model. We do this twice: first using intuition and then using calculus. We learn that this game has a first-mover advantage, and that it comes commitment and from information in the game rather than the timing per se. We notice that in some games having more information can hurt you if other players know you will have that information and hence alter their behavior. Finally, we show that, contrary to myth, many games do not have first-mover advantages. Professor Ben Polak: All right, so today I want to do something a little bit more mundane than we did on Monday. I want to go back and talk about quantity competition. So in the first half of the course we talked about price competition. We talked about quantity competition. We talked about competition with differentiated products. I want to go back and revisit essentially the Cournot Model. So this was the Cournot Model: two firms are producing, are choosing their quantities simultaneously. Firm 1 is choosing Q1 and Firm 2 is choosing Q2. And all of this is just review so this is all stuff that’s in your notes already. This is the demand curve. It tells us that prices depend on the total quantity being produced. So this is Q1 + Q2 and this is prices, then the demand curve is a straight line of slope b. That’s what this tells us. Here’s our slope –b. And we know that payoffs are just profits, which are price times quantity, revenues, minus cost times quantity, costs, we’re assuming constant marginal costs. We did this model out in full in maybe the third week of class and we figured out what the best response diagram looked like. And if you remember correctly, this was the best response for Firm 1 taking Firm 2’s output as given, and this is the best response for Firm 2 taking Firm 1’s output as given, and there were a few other details in here. This was the monopoly quantity, this was the competitive quantity and so on, but this is enough for today. Actually, we had done a bit more than that, we’d actually worked out in class what the equations were for these best responses. Here they are. I’m not going to re-derive these today, but they’re somewhere in your notes. We kind of crunched through some calculus and figured out what Firm 1’s best response looks like algebraically, here it is. So this is the equation of this line, and similarly for Firm 2, so this is the equation of this line. Finally, we figured out what the Nash Equilibrium was, and there’s no prizes here: the Nash Equilibrium in Cournot was where these best responses crossed, and this is the equation for the Nash Equilibrium. Have I made a mistake? The best response, oh thank you. The best response for Firm 1 is a function of Q2, exactly. Thanks Jake. So this is all stuff we did before, I want to go back to this model now to revisit it in the context of thinking about sequential dynamic games. So what we’re going to do is–we’re going to do is, we’re going to imagine that rather than having these firms choose their quantities simultaneously, one firm gets to move first and the other firm moves after. Let’s be clear, we’re going to assume that Firm 1s moving first and the other firm–we’ll assume Firm 1’s going to move first–the other firm, Firm 2, is going to get observe what Firm 1 has chosen and then get to make her choice. So we’re going to see what difference it makes when we go from this classic simultaneous move game into a sequential move game. This model is fairly famous and I’m almost certainly spelling this wrong, but it’s due to a guy called Stackelberg. So what we’re looking at now is the Stackelberg Model. So how do we want to think about this? A natural question to bear in mind is, assuming we’re in this world of quantity competition, is it an advantage to get to move first, to set one’s quantity first? Or is it an advantage to be able to wait, see what the other firm has done, and then respond? Is there an advantage in going first or is there an advantage in knowing a bit more about the other firm and being able to move second? That’s going to be the question at the back of our minds for most of today. So how are we going to think of this? How are we going to figure this out? There shouldn’t be a silence in the room. There should be an instance answer. How are we going to figure this out? We’re going to use backward induction right. This is going to be an exercise in backward induction. We won’t be able to draw a tree here because the game’s too complicated because there’s a continuum of actions, but nevertheless, we are going to use backward induction. So what does using backward induction mean here? Using backward induction means starting at the end and the end is what? The end here is Firm 2. Firm 1 is going to move first, Firm 2’s going to observe that choice and then move. So the end of the game is Firm 2. So we’re going to solve out Firm 2’s problem first. We’re actually going to do this entire analysis twice. We’re first of all going to do this analysis a bit intuitively looking at pictures, and then I want to go back and crunch it out in the math. I want to get used to seeing that we can actually do it crunchily. This board is just review, so I’m going to get rid of it I think. I didn’t manage to get rid of it, never mind. We’re not going to be using this board. This is just what we did do in the simultaneous move game, so we’ll get rid of it. So in the sequential move game we’re going to start by analyzing the move of Firm 2. So imagine yourself as the manager of Firm 2, you’re coming along to make your output decision. The output of Firm 1 is already set. So analyze Firm 2 first, Firm 2 sees Q1 and now I must choose Q2. So what is Firm 2 going to do? So I claim we already know this. We’ve already solved this problem. When did we solve this problem? Anyone know when we solved this problem? The problem of what Firm 2’s going to do. Well we already solved it about a month ago when we looked at the simultaneous move game, because what we worked out then was what is Firm 2’s best response for any particular choice that Firm 1 makes? We already solved out that problem. It took us a while to solve out, but basically it was to maximize Firm 2’s payoff, taking as given Firm 1. We already know what the equation looks like and let’s just remind ourselves what the picture looked like, just a repeat of the picture we had before. We said for any particular choice of Firm 1, Firm 2’s best response can be drawn on a best response diagram, and looked like this. It’s exactly the picture we have up there. So this is the best response for Firm 2 taking as given the choice of Firm 1. We even know the equation of it–I won’t bother rewriting that. We already know the equation. So in some sense Firm 2’s problem is a problem we’ve already seen. We already worked out months ago what Firm 2 should do, taking if Firm 1’s output is given and that’s exactly the problem Firm 2 finds herself in. She wakes up one morning, Q1 has been set already, and now she must choose Q2 to maximize her profits, so she’s going to choose her best response. Just to remind you how we read this picture, for any particular choice of Q1 we go up to the line and look across, this tells us what Q2 will respond. So if Q1 chooses this amount then Q2 will choose this amount. If Q1 chooses this amount then Q2 will choose this amount and so on. So there’s no mystery here. We already know what Firm 2’s going to do. So by definition, the best response of 2 to Q1 tells us the profit maximizing output of Firm 2 taking Q1 as given. All right, so we’ve done the second step for this already, we already know what Firm 2’s going to do. Of course, the additional step here now is that Firm 1 knows that Firms 2’s going to do it. Firm 1’s going to move first and Firm 1 knows that after she sets her quantity Q1, Firm 2 will respond by choosing her corresponding quantity, which is the best response to it. So if Firm 1 knows that if Firm 1 were to choose this quantity, then Firm 2 will respond by choosing this quantity, and Firm 1 knows that if she chose this smaller quantity, then Firm 2 will respond by choosing this larger quantity. Is that right? So Firm 1 can anticipate how Firm 2 is going respond to each of these choices. So let’s just make that clear. So in particular, if Firm 1 was to choose Q^1, I’m not suggesting it should, but if Firm 1 was to choose this Q^1, then Firm 1 knows that Firm 2 will produce this quantity, which is the best response to Q^1, and if Firm 1 were to choose Q^^1, then Firm 2 will respond by choosing the best response to Q^^1. So this is pretty straightforward so far, but what we’re able to see now, is the problem facing Firm 1, which is the interesting problem. The problem facing Firm 1 is, what quantity should Firm 1 choose knowing that this is how Firm 2 is going to respond? Before we solve this out mathematically, I just want us to think it through a little bit. So the first way I want to think this through is, is to make the following observation. From Firm 1’s point of view, Firm 1 knows that any Q1 she chooses leads to a response on this line by Firm 2. That’s what Firm 1 knows. So Firm 1 is effectively choosing points on this line. Let me say it again, so what’s actually happening is Firm 1 is choosing Q1 and Firm 2 is responding by choosing a Q2 that puts them on this line. But in effect that means Firm 1 is choosing points on this line. So you could think of Firm 1’s problem as, choose the joint output level on this line that maximizes Firm 1’s profits. Think of Firm 1’s problem as choose the combination of outputs on this line by choosing Q1 and then Q2 responds, choose the combination on this line that maximizes profits for Firm 1. So I’m belaboring this a little bit because it’s a more general mathematical idea here. How many of you are in Econ 150 right now? So for those of you in Econ 150, this should be a very familiar kind of thing. This is a constrained optimization problem and you’ve been having constrained optimization problems rammed into you for the last month or so, so this is an example of a constrained optimization problem. You have to choose a point but you can’t choose a point freely: you have to choose a point on the line. Okay, so let’s talk about it a bit more before we do the math. Let’s actually redraw it again since I made a mess of this picture. So one thing you might want to ask is, in making this choice for Firm 1, should Firm 1 choose more or less or the same as it used to choose when the problem was simultaneous? So let’s put in again what it used to choose when the problem was simultaneous. I’ll put it in just faintly. So here’s our old Cournot picture–looked like this–and this was the quantity that Firm 1 chose in the Cournot game, so let me call that Q1C. So certainly one possibility is that Firm 1 could choose her Cournot quantity, she can certainly do that, and she knows that if she does that, Firm 2 will respond by choosing the best response of Firm 2 to Firm 1 choosing the Cournot quantity, but we know what that is. What’s Firm 2’s best response to Firm 1’s Cournot quantity? It’s Firm 2’s Cournot quantity, right? So if Firm 2 does that, if Firm 1 chooses the Cournot quantity, then Firm 2 will also choose the Cournot quantity. So one thing that Firm 1 could do is effectively choose the old equilibrium. That’s certainly something that’s available to Firm 1. But Firm 1 could also do other things. Firm 1 could produce less than that or Firm 1 could do more than that. So who thinks Firm 1 should play–should choose the old equilibrium quantity? Who thinks Firm 1 should choose more than that? Who thinks Firm 1 should choose less than that? Let’s just try it with the camera on you. So once again, how many people think that Firm 1 should choose the old equilibrium quantity? A dribbling of hands, and how about less than that? A few hands and then they went down again, and how about more than that? There’s a majority for more–turns out more is correct, so that’s good news. Why? Why do we think Firm 1 should produce more than it used to produce before? Any takers on this? Well let’s think about it. As Firm 1 produces more, or if Firm 1 were to produce more, then Firm 2–my voice is going–then Firm 2 would produce what? Less. As Firm 1 produces more than her Cournot quantity, Firm 2’s response is to produce less. Does anyone remember the jargon for this? What do we call games where the more I do of my strategy the less you do of yours? “Strategic substitutes,” good. This is a game of strategic substitutes. What that means is that as Q1 goes up, Q2, the best response of Firm 2 to Q1 goes down. So what? We can look at that just by looking at the picture. Well the “so what” is, now we’re in a sequential game. If Firm 1 produces more than her Cournot quantity she induces Firm 2 to produce less. That’s what we just said and that’s what? That’s good for Firm 1. My producing more inducing you to produce less is good for me. It’s going to keep prices higher in the market. Is that right? So let’s just think it through again. In the Cournot equilibrium, the choice of Firm 1 was the best choice for Firm 1, taking the choice of Firm 2 as given. That was the old Cournot quantity. But now in the Stackelberg setting, the sequential setting, there’s an additional feature. Firm 1 doesn’t have to take Firm 2’s output as given. There’s an additional reason for producing at the margin, which is, at the margin if I produced some more units of output, that leads you to produce less which is good for me. So that suggests that I’m going to produce than I used to produce under the old assumption. So this suggests that Firm 1 should set Q1 bigger than Q1C to induce Q2 to be less than Q2C. So the first thing we’ve learned–we’ll see this in the math later–is that Firm 1 will in fact produce more than they used to under Cournot, and that will result in Firm 2 producing less than Cournot. Now we’ve already got a lot on the board now, we can actually solve out intuitively the problem. Do we think that Firm 1’s profits, by this procedure, are the same as they were under Cournot? Are they less than they were under Cournot, or are they more than they were under Cournot? So just let me say it again. Firm 1 is going first now. We’ve argued that Firm 1’s going to produce more. Do we think that Firm 1’s profits at the end of the day are going to be the same as they were under Cournot, higher than they were under Cournot, or lower than they were under Cournot? So let’s have a poll again, let me get the camera on you guys. So who thinks their profits are going to be the same as they were under Cournot? Who thinks the profits have gone up? Who thinks the profits have gone down? We’re in good shape here because indeed the profits have gone up. There’s a very simple argument why the profits have to have gone up. How do we know the profits must have gone up? Let me actually–it’s simple enough–let me grab a mike on this. How do we know the profits just must have gone up? There was a hand in the back, was there a hand in the back? Yes, way at the back. How do we know profits must have gone up here? Way at the back. Student: If Firm 1 was going to lower their profits they wouldn’t have chosen to produce more. Professor Ben Polak: All right, good exactly. The fact that Firm 1 has changed their output, and in particular, are producing more, tells you they must be able to increase their profits by this maneuver. Let’s just think that through. One option that was available to Firm 1 before was to set output at the Cournot level. If Firm 1 had set output at the Cournot level, that would have led Firm 2 to set output at the Cournot level, and in that case, profits would have been exactly the same as before. The fact that Firm 1 has moved away from that must mean there are higher profits available. Say it another way, Firm 1 could have had exactly what it had before, so it must be doing at least as well as it was doing before, and the fact it has changed means it must be doing better than it was doing before. So indeed, Firm 1’s profits have gone up. We don’t even need any math to prove that: it just must be the case logically. What must have happened to Firm 2’s profits? What do you think has happened to Firm 2’s profits? That’s not so immediately obvious. It’s obvious, I think, that Firm 1’s profits have gone up here because Firm 1 could have had the same old profits and has chosen something else. But it’s not immediately obvious what happened to Firm 2’s profits, is that right? Before we get to what’s happened to Firm 2’s profits let’s go through an intermediate step. Let’s try and ask what must have happened to total output in the market in this example–in this nice simple example. That’s not immediately obvious either. Why? We’ve argued that Firm 1’s output went up but Firm 2’s output went down relative to Cournot. So it’s not immediately obvious whether the sum of those two Q1 + Q2 went up or down. We’d like to know what happened to Q1 + Q2, total output, in the market. By the way, one particular reason we might care about this is of course consumers would like it to have gone up. Because if their total output has gone up, prices have gone down, and that’s good for consumers. So if you’re the regulator, if you’re designing this industry–if you’re working for the Justice Department, or if you’re working for European Commission–you’re going to want to know the answer when we switch from a simultaneous setting to an asymmetric setting where there’s a leader firm and a follower firm, is that going to be good for consumers or bad for consumers? Well let’s have a look. Well we know that Firm 1’s output went up and we know that Firm 2’s output went down, but can anyone tell me what happened to the total output and why? Let’s have a poll again. Who thinks total output went down? Who thinks total output stayed the same? Who thinks total output went up? There’s lots of abstentions. Let’s try that again because too many abstentions. Who thinks total output went down? Who thinks total output stayed the same? Who thinks total output went up? That’s pretty split. So I think total output–I know actually–that total output went up, and I claim I can see it on the picture. I claim if you stare at that picture you can actually see that total output must have gone up. Who’s good at looking at a picture? Let me get the mike in here. The picture’s there. Let me try this person. Your name is? Professor Ben Polak: Andy go ahead. Student: Judging by the slope of the line you know that as it moves the amount that Q1 changes will be greater than the amount that Q2 goes down. Professor Ben Polak: Good, so what Andy said, what Andy’s saying is look at the slope of the line along which we slid. When we went from Cournot to the Stackelberg equilibrium, we started here and we slid in this direction down this line: Q1 went up and Q2 went down. And what Andy’s pointing out is we can see from the slope of this line that Q1 goes up more than one unit for every unit of reduction of Q2. Let me say it again, for every unit of increase of Q1 there’s less than a proportion–sorry, say it again. For every unit of increase of Q1 there’s less than a unit of decrease of Q2. Another way of saying it is the slope of this line is less than 1. Everyone see that? So we know by the slope of the line–we know that Q1 had to go up more than Q2 went down, which means total output went up, which means that prices went–what happened to prices as total output went up? That shouldn’t be hard, everyone’s taken 115 here, right? So when total output went up, prices went down, good. Demand curves sloping down is not as important as backward induction but it’s still quite important. So prices went down. So therefore, we now are ready to say what happened to Firm 2’s profits. Firm 2 is producing less than before. Firm 2’s costs are the same, and prices have gone down, so what’s happened to Firm 2’s profits? They must have gone down as well. So Firm 2’s profit has gone down, and we know that consumer surplus, CS, consumer surplus, has gone up. For those people who remember their 115, prices have gone down, quantities have gone up, so consumer surplus here has gone up. So we’ve analyzed everything qualitatively I can think of in this game without reference to any math at all. Is that right? We really haven’t done any math there. We talked about slope of the line. I guess that’s math in junior high or something, but we haven’t really done any math here, right? Is that fair? We already have a pretty good intuition for what’s going to go on in this market. We think Q1’s going to go up. We think Q2’s going to go down, we think that Firm 1’s profits are going up. We think Firm 2’s profits are going down. We think total quantity is going up. Now let’s see if we’re right. Let’s go back and do the math. So I want to spend a bit of time grinding this out. So I don’t claim that doing the math is fun, but I want to prove that we can do it, because otherwise everyone’s going to either think that this was all kind of just blah, blah, blah, and/or people are going to be scared to do the math when it arrives on a homework assignment. So for now we’re going to–more or less for the next few minutes–we’re going to forget we’re economists and we’re going to turn into nerds. That isn’t a huge transition, but we’ll do it anyway. I’ve got the demand curve up there, so the demand the curve is still there it’s P = A - B [Q1 + Q2] and I’ve got profits written up there, but let’s put them somewhere more convenient anyway. So P = A - B [Q1 + Q2] and profit is equal to–profit for Firm i is equal to P Qi–C Qi. And what we’re told to do in backward induction is what? First of all, solve things out for Firm 2 taking Firm 1 as given, and then go back and solve for Firm 1. So exactly the discussion we’ve just had informally, we’re now going to do more formally. So backward induction tells us, solve for Firm 2 first, taking Q1 as given. What is that problem? It’s this sort of boring math problem, it says maximize by choosing Q2 the profits of Firm 1, so that’s going to be A - B Q1–B Q2. That’s the price times the quantity Q2, - C Q2. So this bit here is the price. These two terms together are revenues, and this term is costs. Now I could do that, I could grind that bit out, but we already ground out that bit out three or four weeks ago right, so I’m not going to grind it out again, we know how to do that. But by the way, let’s just remind ourselves what we did. We differentiated with respect to Q2. We set the thing we found, the derivative, equal to 0. That was our first order condition. And then we solved for Q2. Is that right? So when we did that, we went through the first order condition and then we solved it, we know what we actually got. So what we actually got was that Q2*, if you like–or Q2 let’s just call it–is equal to [A - C] / 2B - Q/2. In fact, I’ve already given it to you up there, it’s up on that top board. It’s the best response for Firm 2. So again, I could do this again, but since we did it a few weeks ago I don’t want to redo it. Now the more interesting part, not thrilling, but a little bit more interesting. Now let’s solve for Firm 1. So what is Firm 1 doing? Firm 1 is also trying to maximize profits. Firm 1 is choosing Q1 and Firm 1–at least initially it looks like the same problem. It’s A -B Q1–B Q2 Q1–C Q1, this is the same line we had before but now whereas Firm 2 was taking Q1 as given, Firm 1 knows that Q2 is given by this formula here. So what we’re going to do is we’re going to plug this Q2 into there. Now again, for those of you in 115, this isn’t the only way to do it–I’m sorry 150–this isn’t the only way that we could do it, we could also set up a Lagrangian equation, but for those people who don’t know what that is, don’t worry we’re going to plug in today. So we’re going to plug this in, and when we plug it in, we get a right old mess but let’s do it anyway. So we’re going to get max Q1, [A - B Q1–B [[A - C]/2B - Q1/2] - C] Q1. Everyone okay with that? I’m doing algebra on the board which is not fun but it’s useful to do occasionally. So eventually what are we going to do? Eventually we’re going to differentiate this thing, set it equal to 0, look at our first order condition and so on, just as we normally would. So eventually we’re going to use basically 112 level calculus to solve this thing. Everyone remember how to solve a maximization problem? Yeah? But before we do that let’s tidy up the algebra a bit. So this thing is–let’s just tidy it up. So this is equal to max with respect to Q1–and notice I’ve got an A - C here and once I take this B inside the brackets I’ve got a–[[A -C]/2] here. So I’ve got an [A - C]–[[A - C]/2] so that’s going to give me an [A - C]/2–and I’m really going to pray that the T.A.’s are watching me carefully and are going to catch my errors here. Okay, so I think I’m okay so far but please catch me. What else have I got? I’ve got a -B Q1 here and from in this bracket I’ve got a - - that’s a + B Q1/2. So I have a –B Q1 + B Q1/2 so that’s a –B Q1/2. So far so good and that whole thing is multiplied by Q1. Okay so far? Let’s multiply out the bracket because otherwise I’ll make a mistake. So this is the same as saying [A - C]/2 Q1–B Q1²/2. So far so good? Now we’re at the level where even my very rusty memory of calculus will get us through, so let’s try and do it. So what we’re going to do is we’re going to differentiate this thing with respect to Q1. So differentiating with respect to Q1–let’s do it up here –, we get [A -C]/2 from this term and from the –B Q1²/2 we’re going to get–the two’s are going to cancel rather pleasantly–so we’re going to get B Q1 from that term. Everyone with me so far? I’m going through this in sort of slow steps, I agree it’s not exciting but I want to make sure I don’t make a mistake. So to turn this into a first order condition what must be true about this derivative? At the maximum, what must be true about this derivative? Should be equal to 0, good, and we should just check the second order condition. How do I check the second order condition? I differentiate again and check it’s negative, but if I differentiate again I’m just going to get -B. So -B is certainly negative all right, so second order condition is okay. So let’s solve it out. Solving this for Q1, I get Q1 = [A - C]/2B. So we’re leading in sheer boredom, it has to be done occasionally, Q1 = [A - C]/2B. We’re not done yet. Now we want to go back and solve out algebraically for Q2. I know what Q1 is now, Q1 is [A - C]/2B. How do I find Q2? Somebody? Shout it out, how do I find Q2? I’ve got to plug it in. I’m going to go back and plug this Q1 back into this expression here, so I plug it back in, I’ll get Q2 = [A - C]/2B - 1/2 [A - C]/2B for a total of [A - C]/4B. Is that right? That’s what I have in my notes. This looks good. So I’m now done. I’ve now found the equilibrium. I’ve found that in this leader-follower game, this Stackelberg version of quantity competition, Q1 is given by [A - C]/2B and Q2 is given by [A - C]/4B. Let’s see how it matches up with the intuition we developed before without using any boring math. So first of all we’re comparing Q1 and Q2 with what they used to produce, and what they used to produce is on the top board. What they used to produce–I can use this to guide the camera as well–what they used to produce is [A - C]/3B, is that right? So our claim was that we think the new Q1 is bigger than the old Cournot quantity. So now Firm 1 is producing [A - C]/2B, previously it was producing [A - C]/3B, so that is indeed bigger, that’s good news. So this is indeed bigger than Q Cournot. And our claim was that Firm 2 will produce less than the old Cournot quantity. So Firm 2 used to produce [A - C]/3B and now it’s producing [A - C]/4B, and that is indeed less than the old Cournot quantity. So far so good. What about total output? How do I solve for total output? Add the two outputs together, that’s not too hard. So Q1 + Q2 = [A - C]/2B + [A - C]/4B which is in fact 3[A–C]/4B. Is that right? So it’s going to be 3[A–C]/4B. So I’ve just–actually, for the first time today, I skipped a step, but is that okay? A half plus a quarter is three-quarters. So total output is 3[A - C]/4B. What was total output before? It used to be the Cournot total output, let’s put it here somewhere, this is bigger than 2[A - C]/3B which is equal to the Cournot quantity Q1C + Q2C. So everything we’ve predicted, just by looking at the picture, and thinking about the economics works out in the math. That’s a good thing. We should feel a little bit relieved. I’m feeling a little bit relieved. Everything we thought out intuitively, just using the economics, the logic of the situation, when we grind out the algebra we get the right answers: we get confirming answers. Everyone okay? That isn’t a particularly fun exercise per se, but I want to do it just to show that you can use backward induction to solve out problems exactly. Backward induction and a little bit of what you learned in high school and/or freshman calculus can get you the answer. So now I want to leave aside the math and go back to the economics again. So we started off with a question, who would you rather be Firm 1 or Firm 2, and we know the answer now. Who would you rather be Firm 1 or Firm 2? Firm 1 because Firm 1’s profits went up and Firm 2’s profits went down. Let’s just talk about this a little bit–about what’s going on here. So previously Firm 1 and 2 were just setting quantities simultaneously. We know now there’s an advantage in going first. So suppose we change the game from the simultaneous move game, to a game in which Firm 1 and Firm 2 can make announcements. They can announce how much they’re going to produce. So Firm 1 comes in one day and says, I’m going to produce this much and Firm 2 comes in and can see Firm 1’s announcement. So I’ve changed it into a sequential game, Firm 1 has announced how much it’s going to produce, Firm 2 is going to go afterwards. Is that really a sequential game? Is that going to make a difference? Why is that, I claim that’s not really enough. Let me say it again. We start from the simultaneous move again. If we just change it by simply allowing Firm 1 to announce what they’re going to produce–don’t actually produce it but just announce what they’re going to produce –, you might think that’s a sequential move game and you might think that Firm 1 now has an advantage. But I’m claiming that’s not enough really to give Firm 1 an advantage. Why? Why is that not enough? Let’s try and get some ideas here. Let me come around to this side. So Patrick why is that not enough? Student: There’s no credible commitment that you’re going to produce at that level. Professor Ben Polak: Good, so imagine these two firms are, let’s say that they’re newspaper producing firms and one is owned by NBC’s parent company and one is owned by Rupert Murdoch. And they’re moving into this new market and the market is a town. Both of them are going to issue newspapers in this market that currently doesn’t have any newspapers, and Murdoch simply says I’m going to produce lots of newspapers. There’s no reason for NBC to believe that. So moving first here, it isn’t enough to say you’re going to move first, it isn’t enough even to make a decision that’s reversible. Even if Q1 moved but that decision could be undone that isn’t enough. What we need, and Patrick gave us the key word, what we need is commitment: a word that came up last week. So for moving first to help you here there really has to be commitment. Let’s just get some of this down. There really needs to be commitment for this to work. So going back to the example of Murdoch and his competitor, Murdoch actually has to build the plant. There actually has to be a factory that he’s built in, and that factory can’t just be sold for scrap. So what creates the commitment, in the case when you’ve built the plant is what? Because having built it, it’s a sunk cost, it’s there. So sunk costs can help here. It can help making you committed. Once that money’s gone, you can’t get it back, so you’re really committed to that scale. Does everyone know what I mean by sunk costs, by the way? So here’s a case where a strategic move, entering first and sinking some investments can help you in the marketplace. Let’s also look at this another way. Let’s again go back to the simultaneous move game that we had before, where Murdoch and his competitor, the NBC parent corporation, are in fact, going to move simultaneously. Both of them are in the business of discussing how big a newspaper plant to put in this new town which hasn’t got a newspaper yet, somewhere in Alabama or something. Suppose that there are two boardrooms, both of which are avidly just trying to discuss how big a newspaper plant to build. So suppose that one of the boardrooms, these four people in this row, this is the NBC parent company boardroom and they’re trying to decide how big a plant to build. And over on the other side of the room is our Murdoch group which is in fact–let’s take the row parallel–so these guys over there are Murdoch, are News International Group. And it is a simultaneous move game, so basically we’re in Cournot. Now suppose that Murdoch, just to pick a name out of a hat, might not be the most moral gentleman in the world–who knows? –and suppose that he in fact has hired one of the people in the NBC boardroom, in fact this guy, what’s his name? Professor Ben Polak: He’s hired Ryan to be a spy. So Murdoch has a spy in the NBC boardroom. So Murdoch has a little advantage here, information wise. Why? Because the NBC boardroom doesn’t know what’s going on in the Murdoch boardroom, but the Murdoch boardroom is going to know what’s going on in the NBC boardroom. But to make the problem more interesting, suppose that somebody tells NBCs parent company, that in fact, there is a spy in their boardroom. So these guys know they have a spy, they don’t know who it is. If they knew who it was they’d beat him up or fire him or something –or maybe not–but they know that someone’s there. Maybe they even suspect it’s Ryan, so what should NBC do here? What decision should NBC make? One thing they could do is–they don’t know it’s Ryan but Ryan has this sort of Murdoch like face, so they might just fire him because he might be a spy–or what should they do here? Any takers? You’re in the Murdoch, you’re in the NBC boardroom. You know that Murdoch has some spy in the camp. What should you do? Student: You can come up with a fake plan and see if it goes back to Murdoch. Professor Ben Polak: So Chris is suggesting come up with a fake plan to feed it back to Murdoch, so Chris has been reading spy novels. So if this was a John Le Carré novel, that’s certainly what you would do. You would create a whole bunch of fake information to feed back to the Russians, through this spy who in fact you’ve discovered. That isn’t a bad idea: that might be a good thing to do. It’s pretty hard to do, right, because ultimately these actual decisions have to be made in the boardroom, contracts have to be signed and so on, but I think Chris is onto the right idea here. So Chris’ idea is create a fake plan to feed back to Murdoch, to give Murdoch some misinformation. But there’s another thing you could do, let me get someone who hasn’t contributed yet, anyone else? Yeah, what’s your name? Professor Ben Polak: So Usman what would you do? Student: These guys get the first move now effectively because they can just decide they know. 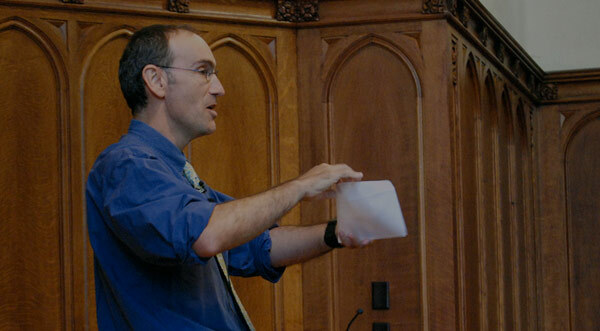 Professor Ben Polak: Say what you just said but shout it out so everyone can hear you. Student: NBC now gets the first move because they can decide and they know the other people are going to respond to it. Professor Ben Polak: Good, so what Usman is suggesting is maybe you don’t feed Murdoch a fake plan, you feed Murdoch the true plan. Effectively, what’s going to happen now is if NBC decided to build a large plant, this information will be fed back to Murdoch, and Murdoch is now in the position of being the second mover. When Murdoch moves, he or she knows what NBC is doing, and NBC knows that Murdoch is going to choose a best response to that. So it’s as if NBC has been put in the position of Firm 1 and Murdoch has been put in the position of Firm 2. Even with the correct plan–so the correct thing to do here for NBC is not necessarily to mislead Murdoch, but just go ahead and build a big plant. Have that information be fed to Murdoch and let Murdoch respond to it. So notice here’s a slightly paradoxical thing. You might think that having a spy in the camp of the other team, you might think having a spy would help you. But here having a spy–or having more information if you like–can actually end up hurting you. Everyone see that? Paradoxically, Murdoch ends up losing by the fact that he was able to predict what NBC was going to do. Now there’s a key to this of course. It was crucial to the argument. What was crucial to the argument? It was crucial to the argument that NBC knew that Murdoch had a spy. The key here is that the other side, the other players, knew you had or were going to have more information. So what’s the bigger idea here? There are two bigger ideas. Bigger idea number one is, games being simultaneous or sequential is not really about timing per se, it’s about information. It’s about who knows what, and who knows that who’s going to know what. In a situation where Firm 1, our boardroom over here, knows that Murdoch is going to have this information before Murdoch moves, that’s actually a sequential game. The timing is somewhat irrelevant. So that’s the first observation, and the second observation is already on the board. What we have learned is sometimes in strategic settings–sometimes not always–more information can hurt you. Sometimes more information can hurt. We have to be careful here because that’s not always true but sometimes it’s true. And the reason that’s true is–the reason is it can lead other players to take actions, in this case, to create a large plant, that hurt you. Now, if you put Monday’s lecture together with today’s lecture, we’ve seen something–two very similar things arose. On Monday’s lecture having fewer options, burning your boats, ended up helping you or having lower payoffs by putting collateral down ended up helping you. And that might seem like a paradox but it isn’t really a paradox because what happened was provided the other side knows you have fewer options, they know you’ve burnt your boats, or they know you’ll suffer if you default on the loan, they know you’ve posted collateral, it will lead them to take behavior that helps you. In the case of the loan, it led to the lender giving you a bigger loan. In the case of the Saxon Army, you at least hope at least that the Saxon Army’s running away. Today, we see that more information can hurt you, and once again, it isn’t really a paradox, it’s the same kind of argument. The fact that the other side know you’re going to have this extra information, leads them to take actions that end up hurting you. So in games, unlike in standard single person decision problems, more information can hurt and more options can hurt and here’s the reason. Now, one other thing to say about this, the game we just looked at, the Stackelberg game we just looked at is an example of something pretty famous. It’s an example of first-mover advantage. It’s an example of a game with a first-mover advantage. Now how many of you have heard–how many of you in the room have heard the term first mover advantage before? As few as that, seriously? The rest of you, how many of you have not heard the term first mover advantage before, one or two? So I’m always a bit weary of first mover advantage as a term. If you ask the students in the business school how many of them have heard the term, they’ve all heard it. It’s a very popular business school term. It’s a very popular term that you see in bad books. So let me just warn you a little bit about this. So if you go to the airport, let’s say the Hartford Airport, and the flight you want to get on is late (which is usually the case), and hence you end up in the bookstore. And you find yourself on the economics and business shelves. You start looking at strategy books and typically the kind of book you find at the airports on business, or strategy, or economics is a pretty bad book. So it has some embossed cover on it and says ‘Strategy for Dummies’, or ‘My Boring Life’ by a famous CEO. I worry about these books because you end up buying these books. You’ve got time on your hands, and you read them, and they give you absolutely terrible advice. So not always, but almost always, and the kind of things they’ll say is: “it’s always a good idea to move first because that way you’ll have a first mover advantage.” This sounds right and I’m always worried about things that sound right. It may mean they’re right, but the problem is that if they’re wrong, they’re tempting, they sort of lure you in. So it’s good to move first because that way you have a first mover advantage sounds right, but it’s nonsense. There are situations of which this is one–there are situations where it’s good to move first. In quantity competition it’s good to set your quantity, to be committed and that will lead the other side to producing smaller quantity which helps you. So sure, there are situations, there are games in which you want to move first, but there are also games in which you’d rather move second. Let me give you an example. This is an example we’ve seen in this class before- rock, paper, scissors. If anybody is going to read those books and believe them, so if anyone’s going to read ‘How to Discover Your Inner Bill Gates’ and base their life on it, and therefore, think there’s a first move advantage, I want to play rock, paper, scissors with that person. Everyone happy that you’d rather go second in rock, paper, scissors? Do I need to prove that or is that obvious? Okay good. Let me just expand a little bit more, into a more real world setting. There are plenty of settings in the real world where the advantage of moving second isn’t because as in, rock, paper, scissors you just get to crush the other guy, it’s simply that you learn from their mistakes. So, for example, in the game of buying new equipment for the office or home it’s great to move second. The other guy goes out and samples some new piece of equipment, I wait to see if it works, and then buy it if it does. Or if I’m setting up a Firm in a new expanding market, let’s say in a new part of the former Soviet Union, I’m quite happy to let some other firms go in there first and then watch what they did and try and learn from their mistakes. If I’m setting a new curriculum for a university, I’m quite happy to let other universities, Duke and Cornell and so on, move first and then I can go in as Yale, see what they did, and for sure they’ll have made mistakes and I’ll learn from them. So there’s plenty of obvious situations where moving second helps you, for the obvious reason that information is often very useful. We argued here, information can hurt you, but there’s plenty of other perfectly natural situations where information is to your advantage. So there are games with first mover advantages, but there also games with second mover advantages. And let me give you one example of a game that neither has a first mover advantage or a second mover advantage, just to convince you that can happen as well. So when you were a child you probably occasionally had to divide a cake and/or candy bar with your sibling. Anyone been in this situation? There was some candy bar or cake and you had to divide this thing between you and your brother and/or sister, is that right? There’s a way in which, there’s a typical way in which we divide things among siblings in that setting. There’s a game we play to divide it. What’s the game we play anyone? I’ll cut and you choose, or vice versa, right. So I’ll cut and you choose neither has first a mover advantage or a second mover advantage–assuming you can cut accurately, neither has a first mover advantage or a second mover advantage, which is precisely why it’s a good way to divide the candy bar. Now, to drive this point home and because we’ve had a very dry lecture up to now, let’s play a game, so everyone can wake up now. Math is over. I want to play a game and the game I want to play for the rest of today is called NIM. It’s not going to surprise you that one of the things we’re going to learn in this game is that sometimes games have a first mover advantage and sometimes games have a second mover advantage, so I’m giving away the punch line. How many of you have played NIM before? If you’ve played it before you can’t play now, so don’t shout out. So this is the game. There are two players and there are two piles of stones. We’ll make the piles of stones into just chalk lines on the board. The players are going to move sequentially. In each turn, the player whose turn it is to move, picks one of the two piles and removes some of the stones, which will just be lines on the board. So they decide how many of those lines to delete. Each time it’s your turn you get to move again, you can choose the other pile this time. You move sequentially, and the only other rule that matters is, the person who gets the last stone wins. So, for example, here’s a case where there’s one, two, three, four, five, six, seven stones on this pile and one, two, three, four stones on this pile. So I’m going to get some volunteers to come on the stage and do this, but I was told I should choose a volunteer. So is Lee-Shing Chang here? So Lee-Shing Chang is going to volunteer for this. I’m volunteering Lee-Shing Chang because it’s his birthday, so a round of applause for Lee-Shing Chang, come on the stage. Who wants to play against Lee-Shing Chang? Anyone else want to play? Who hasn’t played a game yet? How about the guy with the Yale hat on back there, the white Yale hat. I’m staring right at the guy, yeah you, do you want to come up? All right? What’s your name? Professor Ben Polak: Evan, so we’ve got Evan and Leesing, is it Lee-Shing? Lee-Shing and Evan, come up on the stage, there’s a step up here, come on. So we’ll let Lee-Shing go first and we’ll let Evan go second. Have you played this game before? Student: I didn’t hear what the game is. Professor Ben Polak: Okay, he didn’t hear what the game is, so we’ll explain the rules again for those people who are sleeping. If you were sleeping the game is backward induction. All right so the rules of the game are this. They’re going to take turns. In each turn, they’re going to pick one of these two piles. This is Pile A and this is Pile B. And they’re going to tell me how many of these chalk lines to delete, and I’m going to delete those lines. We’re going to go on playing until somebody gets the last line. The person who gets the last line wins. You can get the last line, ten at a go, it doesn’t have to be that there’s only one on the board when you get the last line, but the person who gets the last line wins. So you have to pick a pile each go, and tell me how many lines to remove. So Lee-Shing why don’t you go first, you can choose Pile A or Pile B and tell me how many lines to remove. Any advice from the audience? No advice: you’re on your own here. Student: Can you remove three from Pile A? Professor Ben Polak: Three from Pile A, so three from Pile A. Evan your turn. Stand nearer to the board. Student: Can you remove two from Pile A. Professor Ben Polak: Two from Pile A–okay so Pile A is the popular pile here. Student: Two from Pile B. Professor Ben Polak: Two from Pile B, suspense is building here. Student: One from Pile B. Professor Ben Polak: One from Pile B, all right. It should go fast at this stage, go on. Student: Two from Pile A. Professor Ben Polak: Last stone wins, last stone wins. Professor Ben Polak: Last stone wins, be careful here. It’s his birthday come on. Last stone wins. Professor Ben Polak: Person who gets the last stone wins. Student: Oh okay, so one from A. Professor Ben Polak: All right, one from A, can’t abstain. Professor Ben Polak: One from B, Lee-Shing is the winner here. Very good, let’s get two more volunteers. Everyone understand the game now? Thank you very much gentlemen. Two more volunteers. Have you played before? Come on up. I want to get some female volunteers. It can’t be a male only class. There we go thank you. This may not be as important economics as doing the Stackelberg model but it’s probably a little bit more fun. Your names are? Professor Ben Polak: John and Christine, okay. So let’s make it a bit more complicated this time, so one, two, three, four, five, six, seven, eight, nine, ten, eleven, twelve, thirteen and one, two, three, four, five, six, seven. So we’ll pick two prime numbers, and see if that’s important. Let’s see what happens. Why don’t we say ladies first, so Christine your choice. Professor Ben Polak: This one started off at 13 I believe and this one started off at seven, assuming I counted correctly. Let me get out of the way. Student: Six from Pile A. Professor Ben Polak: Six from Pile A, one, two, three, four, five, six, is that right? Okay. Student: Three from Pile B. Professor Ben Polak: Three from Pile B. Student: Three from Pile A. Professor Ben Polak: Three from Pile A. Professor Ben Polak: One from Pile B. Student: One from Pile A. Professor Ben Polak: All right, so we’re onto this. Professor Ben Polak: All right. Professor Ben Polak: Switch it. Professor Ben Polak: All right, so Christine is the winner, okay. So a round of applause for these two. So I think everyone’s figured out now how to play this game, is that right? Has everyone figured it out? Let me take one of these mikes and go down and just to make sure. Lot’s of people have figured this out. So what is the rule for how to play this game? What’s the rule for how to play this game? People haven’t figured it out, we should play again. So let’s try over here, someone has an answer, how should you play this game? Student: It depends on whether the piles have the same number in them. If they have the same number you want to be second player, and if they have different numbers you want to be first player. Professor Ben Polak: Good, what should you do? Professor Ben Polak: Let’s assume they have different numbers. Student: If they have different numbers you want to make them equal. Professor Ben Polak: You want to make them equal. So the trick to playing this game is–thank you, very good–so the trick to playing this game is if the piles are uneven then you want to make them even–you want to make them equal. Everyone see that? So if you start off with the piles being unequal as we did both times, for example 3 and 2, then you want to be Player 1. There’s a first mover advantage and the correct tactic is to equalize the piles. What you’ll notice now is that player 2 can’t do anything. If they take two from here, you’ll win by taking both of those two. If they take one from here you’ll equalize the piles again. And if they take then one from here you’ve won. So the way to play this game is to equalize the piles. What does that mean? It means if the initial position has unequal piles, uneven piles, then you would rather be Player 1: it has a first mover advantage. But if the initial position has even numbers in the piles then you’d rather be Player 2. Is that right? Because if you start off with an even [correction: equal] number in each pile, the person moving first is going to make them unequal, and thereafter the next person’s in a winning position. So I want us to notice two things from this game. First notice in this game that from any initial position we can very quickly tell who is going to win and who is going to lose, assuming they play well. Three things actually. Second, we didn’t actually use backward induction here, but it’s pretty obvious you do want to use backward induction here. You want to figure out what the end game is going to look like, is that right? It’s very easy to see this game if you look at the end game. The third lesson is what we just said, in this game, sometimes there’s a first mover advantage, sometimes there’s a second mover advantage. So sometimes there’s a first mover advantage in this game, sometimes there’s a second mover advantage in this game. So I’m just illustrating the point we made earlier that it’s not always the case that you want to move first. Sometimes you want to move second. Now today I set up the piles with unequal piles so there’ was a first mover advantage, but that was just to give an advantage to the guy whose birthday it was. I could have set things up with equal lines in each pile, and made the other guy go first.